Every child at Blandford is provided the opportunity to learn in an environment that respects differences and values each student’s culture. At Blandford, the community vision is to inspire and nurture the journey of life-long learning for all. Open any Blandford School yearbook and the Blandford story unfolds. Captured among the pages are moments in time when students and teachers are engaged in the excitement of teaching and learning. This is what Blandford is all about: focused teaching and learning. The school vision incorporates an emphasis on life-long learning and is enhanced by the our Community of Caring character, building values of respect, responsibility, trust, caring, and family. 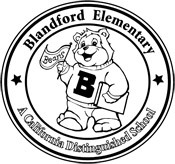 Every member of the Blandford School community is connected through a common purpose that keeps the needs of the students at the center of the decision making process. It’s within this climate that Blandford School offers a safe and nurturing place for all students to learn and acquire proficiency in English Language Arts, Math, Science, Social Studies, Physical and Health Education, and Visual and Performing Arts. Our vision for learning supports the goals articulated through the state standards and promotes high expectations about what students should know, understand and be able to do upon leaving Blandford. The vision exists at the core of Blandford School life and was adopted through shared leadership among the entire Blandford School community.